This summer we have had the privilege to work alongside some amazing homeowners out in Lorain County. For the past 3 weeks we have been working hard with Mr. Bill to build two wheelchair ramps and install safety railings in his home. This process will allow Bill to continue to live in his childhood home for years to come. We are so thankful for the many crews who have contributed to working on these projects, the progress has been really cool to witness. Although Mr. Bill has certainly been impacted by the work of our visiting Next Step groups, we have been blown away by the way he has been able to bless the visiting groups in return. Throughout the weeks Mr. Bill has contributed snacks and refreshment to the crews, including a couple of pizza lunches! However, perhaps the most meaningful moment took place two weeks ago, when Mr. Bill invited the entire group of mission participants out for a barbecue at the cultural club he is a member at. As Mr. Bill witnessed over 70 people fill the outdoor lawn space at the Mexican Mutual Club, pride radiated from his face. Not only was Next Step able to bless Mr. Bill with their physical labor on the worksite, but he was able to bless them with an experience they would not forget. 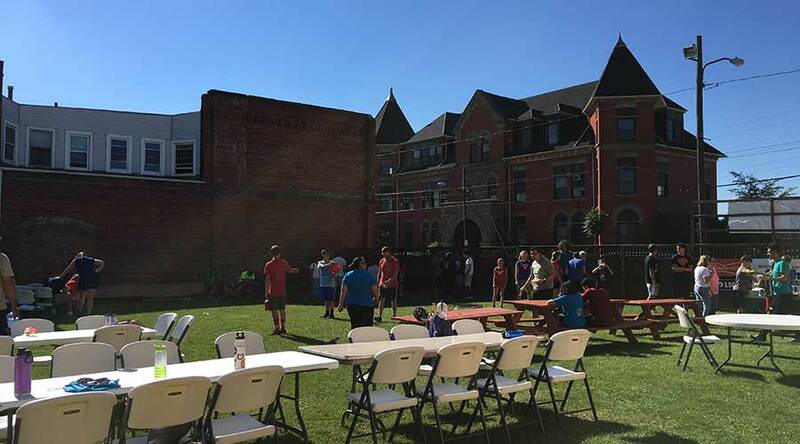 As students played frisbee and spike ball, enjoyed grilled hotdogs, and even participated in an impromptu talent show- it was obvious that this night was special. To top it off, Mr. Bill was able to close out the night by sharing with the group some history about the Mexican Mutual Club and why he deeply loves his community. When people are able to use their gifts to bless others, I believe we get a glimpse of what God has intended for us- all of us. He has given each of us strengths and talents regardless of our age, physical ability, socioeconomic status, etc. We are blessed to witness the unveiling of those through the relationships we have built in Lorain County. Thank you to all who have had a hand in working at Mr. Bill’s! Thank you to Mr. Bill for blessing us with a special memory at your favorite place!